The world of Beauty and Cosmetics can be utterly saturated at times. There’s “something” for everything and it’s hard to decipher exactly what something is for. It’s a great relief to find a product that honestly seems like it covers all the bases and needs anybody could have. 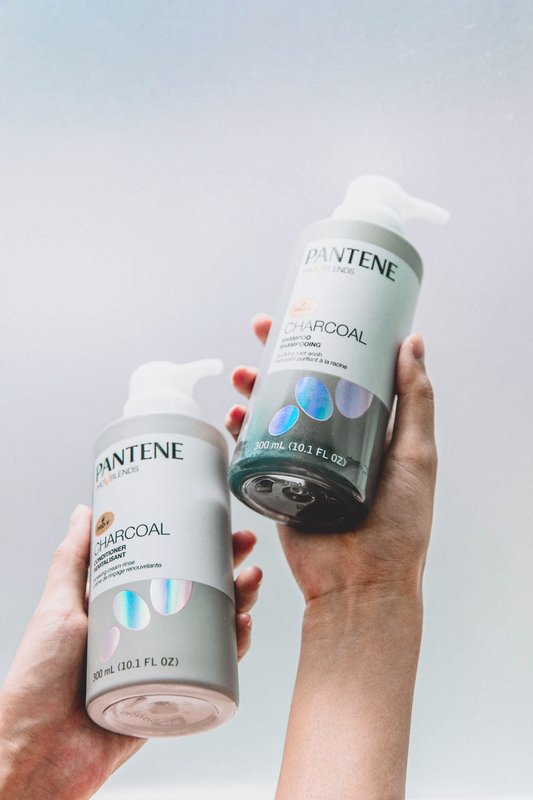 Pantene’s Charcoal Collection has some great features that I love and it’s silicone-free. First of all, I’ve never been a fan of silicone in any cosmetic products. Silicone weighs the hair down, and with time, makes it very dull. It prevents moisture from penetrating the hair shaft and becomes like a magnet for dirt and other ingredients. So in essence, we get a good shine for a couple of days, but over time it will attract more buildup on the hair leading to possible frizz and breakage. So, kudos to Pantene for creating a silicone-free hair line. 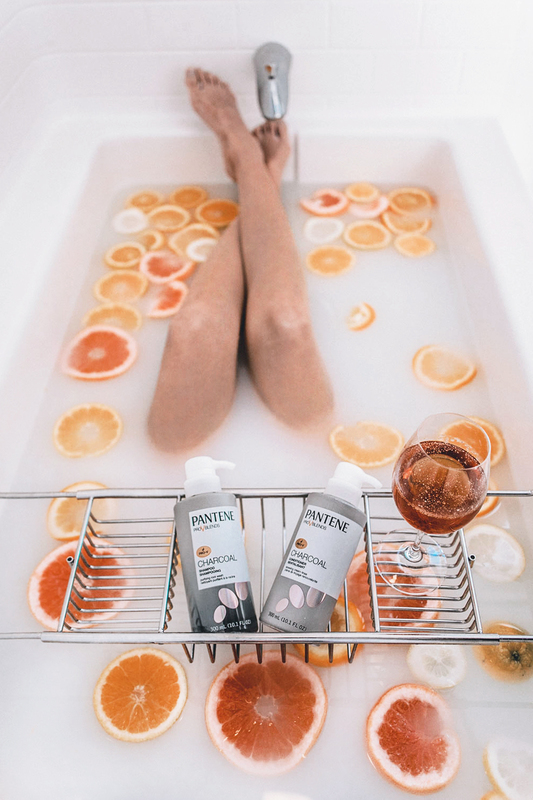 The activated charcoal works to draw out the impurities from the hair while also providing anti-oxidants and vital minerals for your hair, resulting in weightless volume and super-healthy shine. It’s great for dry or brassy hair like mine — from all the dying I’ve done in the past few years and is really suited for all hair types as it gently cleans the scalp and does NOT contain any dyes, parabens, or silicones. I was very pleased with the after-effect on my hair from washing. There was no dryness despite having no silicone and my hair was not clumpy nor dry. After a thorough wash, the charcoal shampoo and conditioner left my hair feeling fresher and cleaner in between washes, and gave my hair more volume. I felt a refreshed and renewed look after each usage. I’d recommend the Pantene Charcoal Collection for anyone who is more health conscious or wants a no fuss solution for your hair. Again I think it seems like it would be very suitable for all hair types. For a limited time, Target is having an in-store and online promotion, where you receive a $5 gift card after purchasing a select number of Pantene’s Charcoal Collection products. This content is sponsored by Pantene. All thought and opinions are my own. I have seen this product and have been wanting to try it. Thank you for sharing! Nice to know that Pantene has a charcoal shampoo and silicone-free too. I’m into charcoal soap and it’s nice to know there is a shampoo with charcoal now. So awesome that they have this already. Would definitely try this if I get to see it in the mall. Charcoal is such a big hit these days! I didn’t know Pantene came out with a charcoal collection. I totally need to go check it out, especially with the ingredients being better than ever. Thanks for sharing your thoughts about the shampoo and conditioner! OMG they sound amazing. Will buy them as soon as I see them in my drugstore. Amazing! I need to look for this line when I’m out- I love charcoal in beauty products!